I used to tell students WAY too much when introducing new concepts in math, and I neglected to let them discover things on their own. When students are told what to think, I believe that it limits understanding. I used to stand up in front of my students and talk about fractions by telling them which ones were halves, thirds, quarters, etc. It is embarrassing to admit that I would teach that way, but now at least I can share what I’ve replaced that method with…lots of inquiry based hands on learning. Today the learning target was: I can use benchmark fractions to estimate. After spending lots of days in a row with tangible real world concreteness, it was a big leap to move to representational models of fractions. 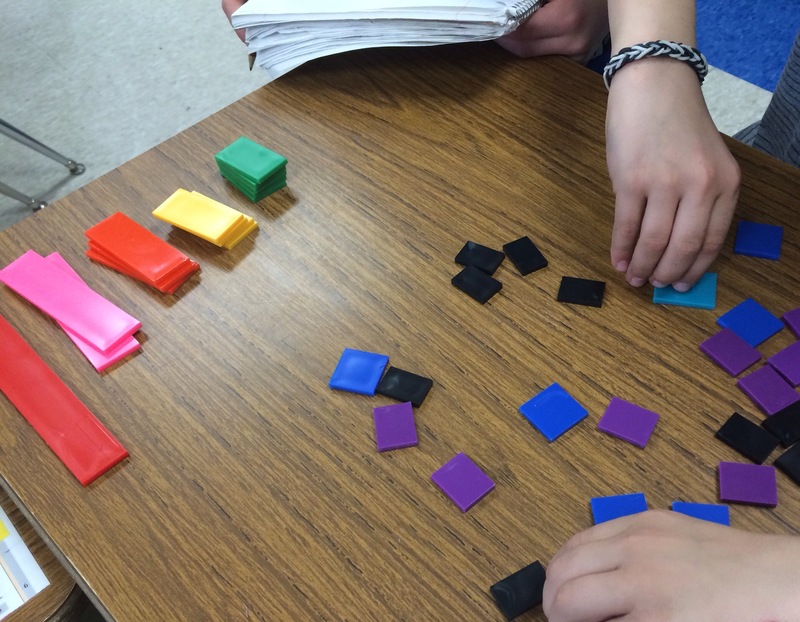 We pulled out the fraction tiles (basically harder versions of fraction strips) that came with our new math series. You’ve seen these, you may even have them, If not there are likely a dozen free ones out there that you can print and cut. Just try a web search for “fraction strips” or “fraction tiles”. Flip over the tiles so that the labels are NOT showing. These students counted and stacked each one to figure out the fraction piece label. Then they noticed the sizes of their fraction tile stacks began to grow! Giving them time to explore has made fractions way less intimidating. The models came much easier to them when they didn’t have confusing labels staring them in the face. 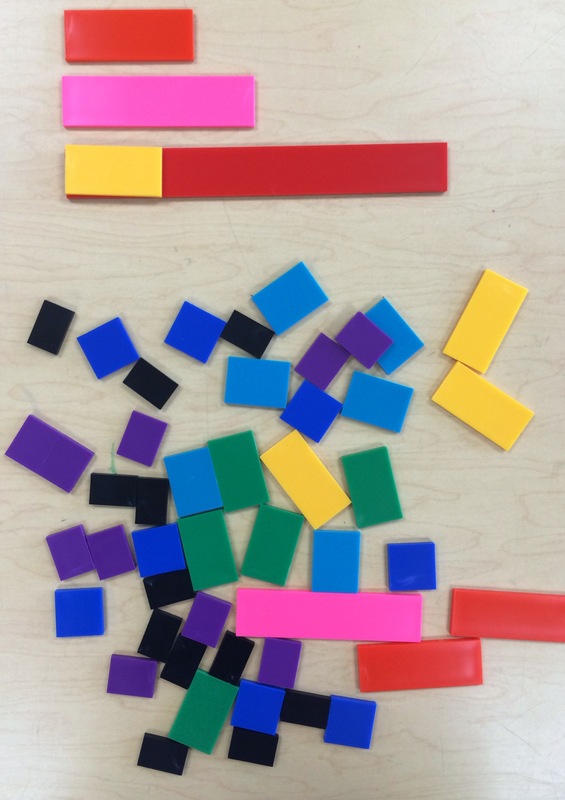 I am definitely a fan of using fraction tiles/strips with the labels hiding. What an awesome way to get them to estimate using benchmark fractions. 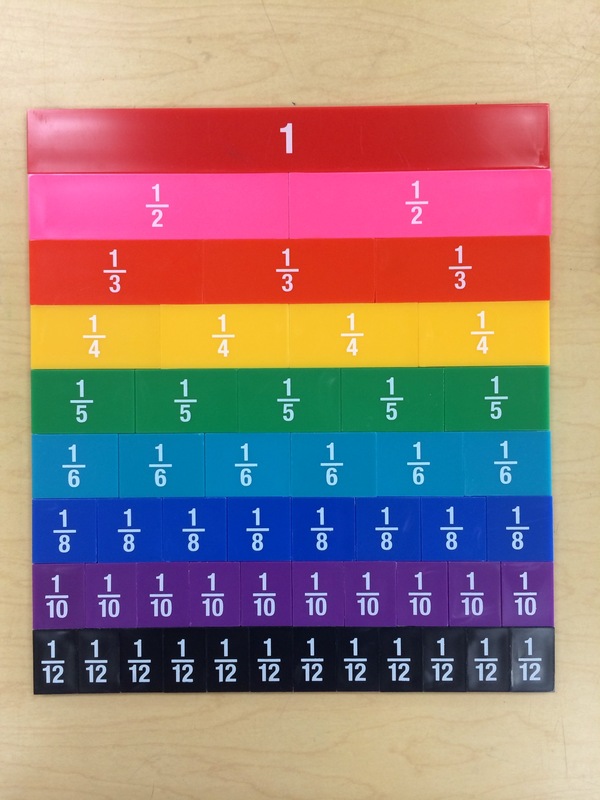 Tomorrow, we’ll explore equivalent fractions with these same strips, and try to connect it to the real world. I can’t wait to see their thinking! Here are three really amazing Earth Day activities for your elementary classroom that all include math. I’ve done them all and they’ve been memorable, educational, and fun! The best part is they always lead to deep moral and ethical conversations. 1. 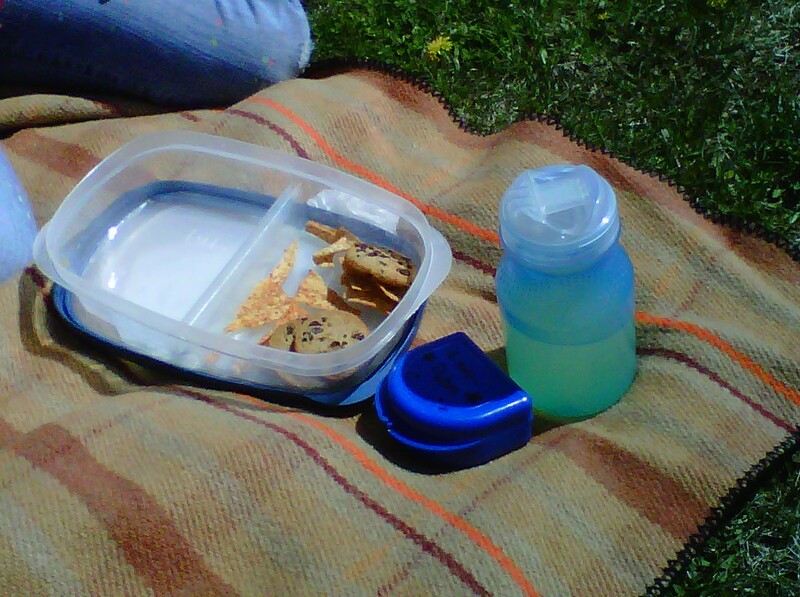 Hold a Trash Free Lunch Picnic: This is a two day project. 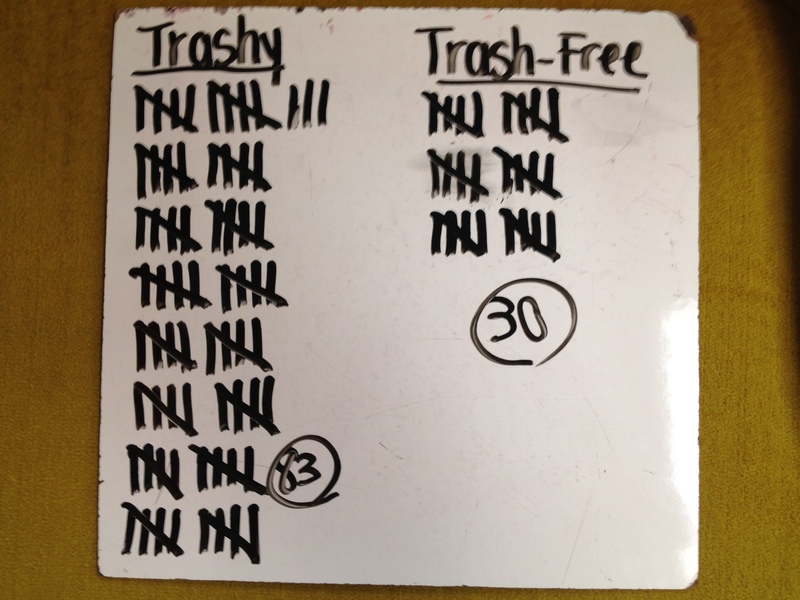 The first day, you ask the students to keep track of how many pieces of trash they have as they eat lunch. For the second day, you send home a note asking parents to pack a trash free lunch, (as trash free as possible) to see if you can cut down on the amount of trash. On the day of the trash free lunch, you ask the students to count how many pieces. Here is an example of a student’s trash free lunch. We kept track on a tally chart and realized the impact we can have if we change one simple thing, how we pack our lunches! Then, the students draw a bar graph or a pie chart to show the results of the tally chart. Record the data of a trashy lunch vs. a trash free lunch! 2. 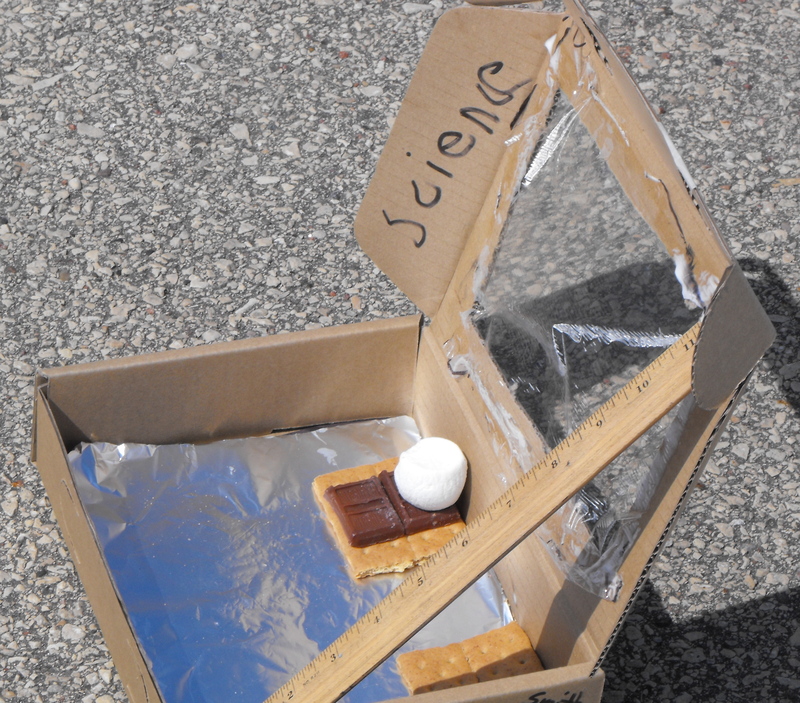 Build a Solar Oven and Bake S’Mores: Show a tutorial for how to make a solar oven a few days before Earth Day. Here is one that could be made from a pizza box! 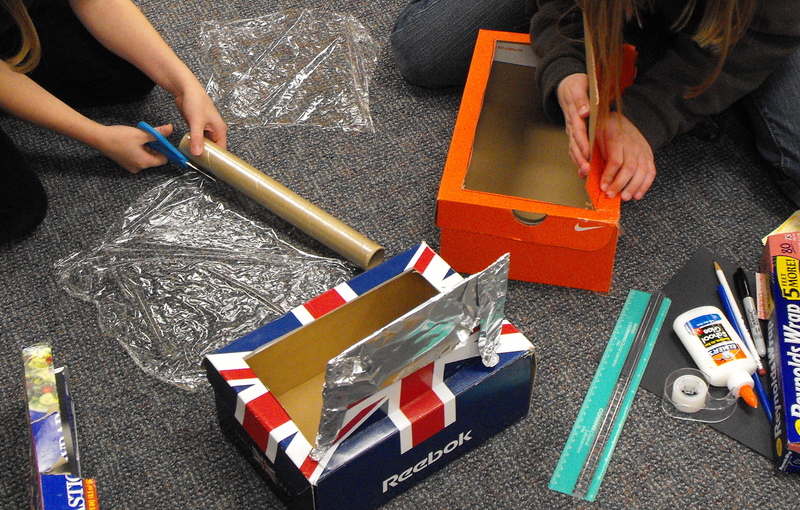 Tell the students to bring their own supplies from home (cardboard boxes, plastic wrap, aluminum foil, tape) and give them time to make them when they first get to school. It took our class about 2 hours. The math involved is awesome, measurement, measurement and more measurement! I brought the graham crackers, chocolate, and marshmallows and they melted like crazy in the sun. It was super fun! Here are a few photos. Students bring in their own materials, but you may want to have some extras on hand. This student even put a skewer in the middle of the oven, too bad they decided not to use it in the end. 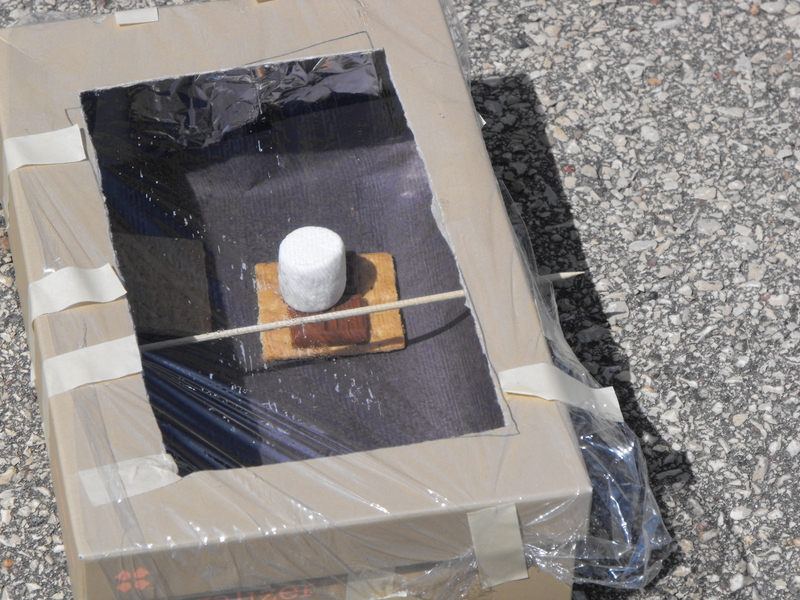 Some students learned the hard way that you need to CLOSE the solar oven! 3. Study an Important Environmental Issue and Act on it: Perhaps the best Earth Day activity we’ve done is something that felt meaningful, like we could make change happen! We studied the Great Pacific Garbage Patch by watching videos, reading about it, doing some math problems surrounding conservation, and by writing persuasive letters. 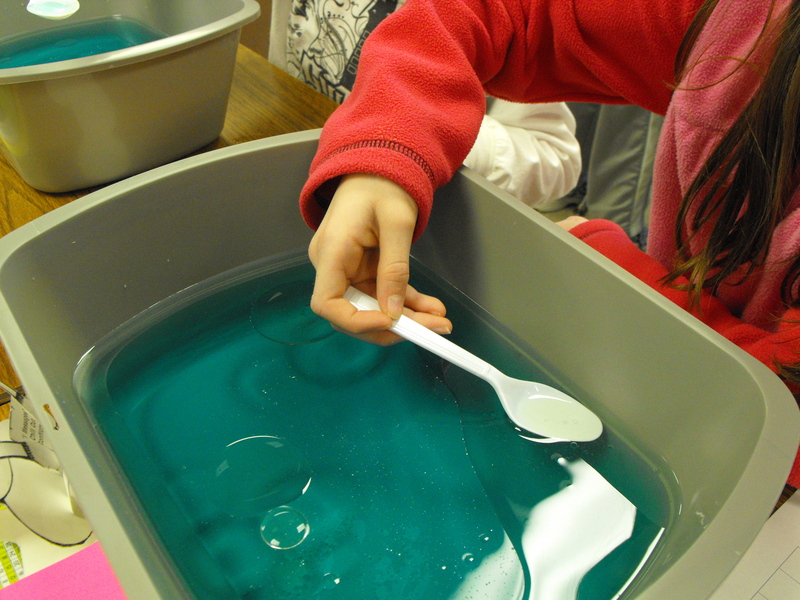 We ended the project by doing a water pollution science experiment. Here are some photos of us trying to “clean” water, so students could find out how truly difficult it was. As they work, each tool they borrow from me costs them money. They have to keep track of the cost of their clean up. 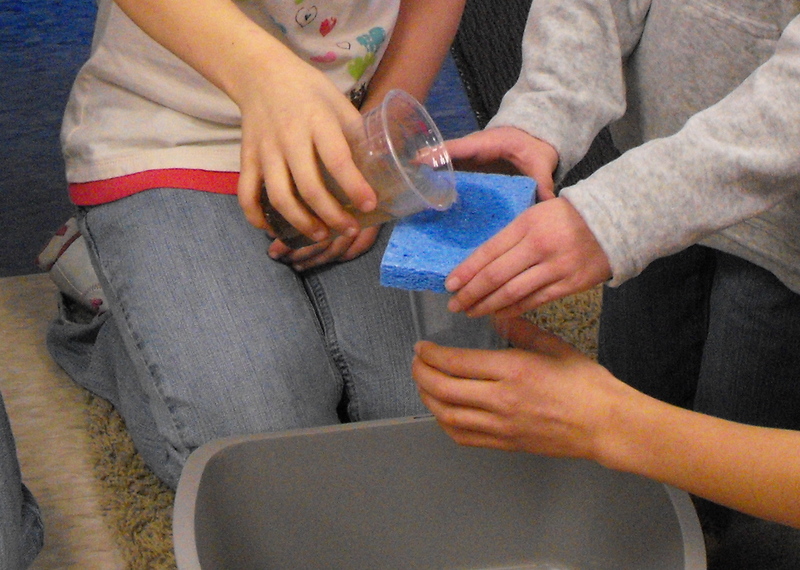 Students are trying to clean out a polluted basin of water using different tools (all of which cost different amounts of money). They keep track of their successes and the cost of cleaning out their basin of water. A student is trying to remove vegetable oil from their basin of polluted water. NOT easy! The bottom line, is there are so many things that students can do to learn about alternative energy, and to study current environmental issues. Instead of encouraging them to recycle with a coloring sheet or a worksheet, engaging them in these issues will help them feel an authentic push to do it! The way to a child’s stomach heart brain is most definitely with sweet treats. While I don’t like to sugar up my students, I do like when they can connect math to the real world. That was exactly my mission when I brought in a pan of brownies. If all else fails, capture their interest with food! So far at this point, we had examined the definition of a fraction, and thought about things that come in halves and quarters. It was time to move into some more new vocabulary, the numerator and denominator of a fraction. 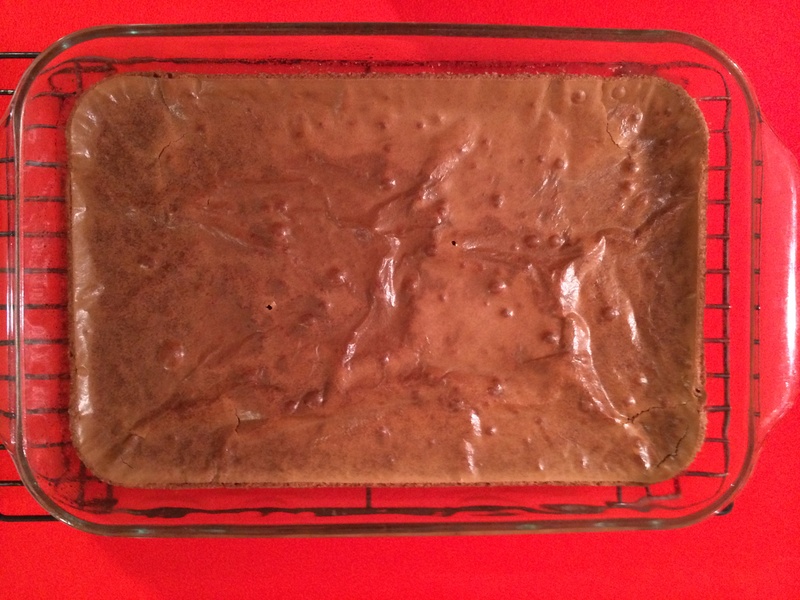 In came the pan of brownies. I brought it over to a large rectangle table and had them all gather around me. As they were salivating I asked them how I could split this pan into fractions so that we’d all get an equal amount. I asked them to draw what that looked like in their math journals knowing that we had 25 students in the room. This was easier said than done. For some reason, a bunch of them abandoned the hard work we’ve done with arrays, and started drawing diagonals and squiggly lines all over their papers. It was like they heard the word “fraction” and felt they needed to abandon everything they knew for this brand new concept. Then, I asked them to start sharing solutions, and we started to get somewhere. Arrays popped up on the chalkboard, 2 x 13 arrays (“I didn’t want to leave the teacher out!”), a 5×5 array and a 3 x 10 array. I asked them which one would get them the best deal. The numerator and denominator suddenly became clear! They didn’t REALLY get it though, until the last person got their brownie. At that moment, I gave her my piece, telling her how proud I was that she was so patient to wait and be last. 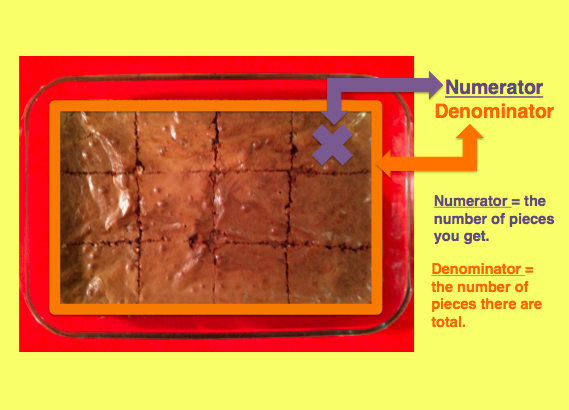 That was when the numerator part really sunk in, because I announced that she was getting 2/26 of the brownie, while everyone else only got 1/26. It was a lesson in patience as well as a lesson in math. It was a pretty sweet mini lesson! I am a huge fan of simple games for upper elementary students. Sometimes the less flashy, the better, so that students can understand the purpose and the math behind them. 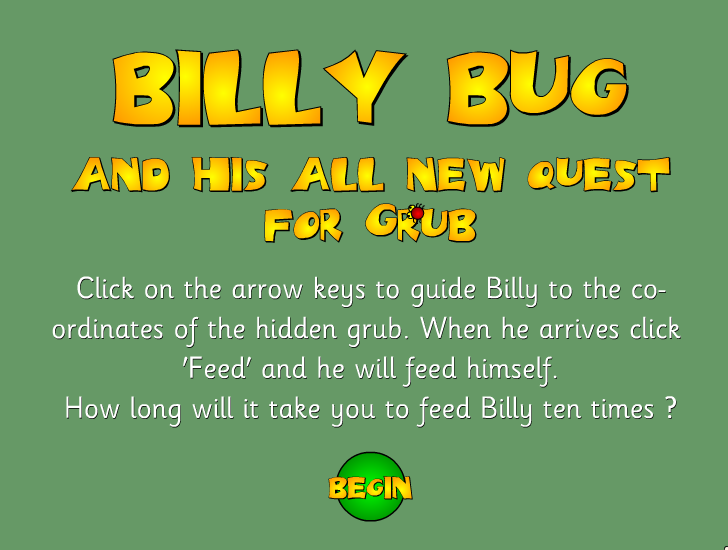 One of my favorite games to have available for students to play is Billy Bug. It is a coordinate graphing game and it’s super easy and fun. I’ve also used this with 4th and 5th graders as a short warm up during a summer school educational games online class. It is simple enough that it can be played for 5 minutes. That is really all you need! A great review of coordinate graphing in a simple and fun way! Third Graders are Googling the Answers to Math Assignments? First, I have a “contact me” section on this blog, for anyone who may need to get in touch. I received this email through that form. Second, I recently put out a free resource called Doggy Dilemma for teachers. It is an open ended problem that requires a lot of reading, writing and thinking. There is no immediate answer, and all students would have a different answer in the end. This person is likely a 3-5th grader (since that is the target age group of the problem). This person is incredibly resourceful and bold. Not only does she google the problem, but she thinks to contact the author of the problem for an answer! After I got over the shock of receiving this message I thought to myself, THIS is why I create what I create. No child should be able to google the answers to a great math problem. What do you think about this?! I would love to know your thoughts. Whenever I have connected math to the real world, I’ve seen a boost in achievement in my classroom. Fractions are REALLY important concepts that must be connected to student’s lives. When I first started teaching, I would just plod along in the book. I would hand out worksheets with rectangle boxes that students would just fill in. They’d write the numbers without really connecting it to much of anything. It was kind of a disaster! On the student planner that day, I put an assignment to look for things that come in halves or quarters at home as well. We can always add more! Now, each time we talk about a fraction, we try to picture something from this list. I am hoping that these concrete examples will really help them understand when I move them into representational symbols and numbers. 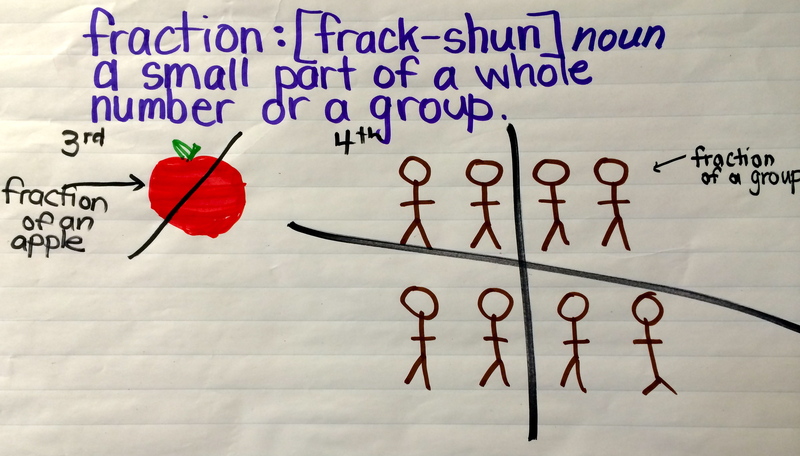 What Exactly is a Fraction Anyway? When I was a student in elementary school, I dreaded learning about fractions. It was a very tough concept for me. All I remember is shading in boxes and finding common denominators. I never understood what I was doing. I decided as a teacher that my mission was to help fractions make sense to my students. So I introduce the concept very slowly and very carefully. Because this is so abstract for students, it must be connected to the real world the whole way through the unit. We started learning about fractions by trying to figure out what a fraction actually is. I know that sounds obvious, but I need to find out what my students know. So I posted the question, What is a fraction? I gave a large piece of paper to small groups and asked them to write everything they know. They all pretty much came back with something along these lines. There were a lot of I don’t knows, and a lot of blank stares. The people who did write something just wrote symbols or numbers. 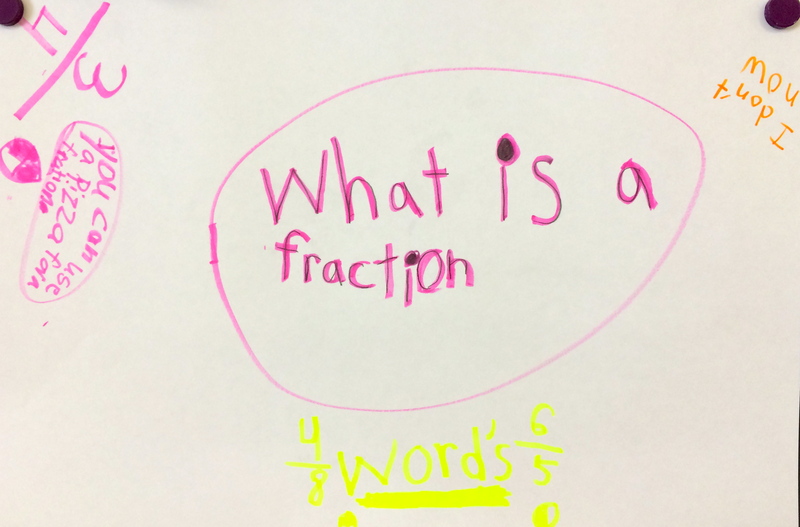 Not one student could tell me what a fraction really was. So I tried to clarify it for them with a simple drawing. Now that the definition is out of the way, maybe we can move into the conceptual understanding part! I make it a point to say those words daily as we talk about what we learned the day before. The emphasis in the Common Core State Standards for fractions in third grade is on parts of a whole, so that is what we’ll focus on! 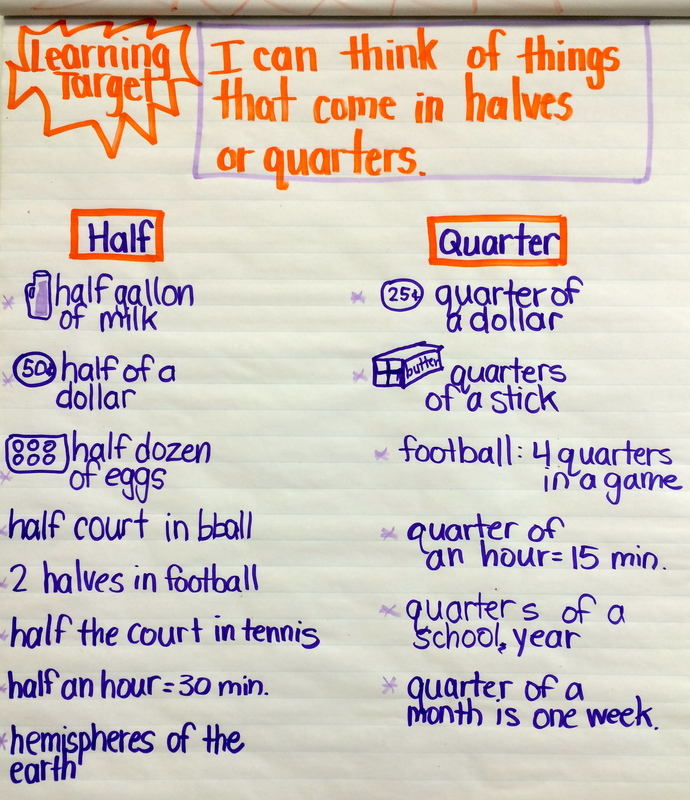 How do you help your students know the meaning of math vocabulary?